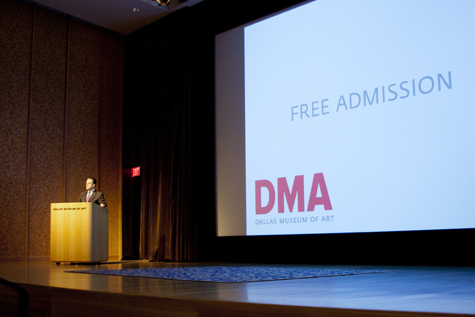 Yesterday we announced our move to free general admission in 2013 along with the launch of an innovative free membership model, the DMA Friends & Partners program. DMA Friends & Partners will not only strengthen our existing relationships with you but also forge new ones, expand audiences throughout greater Dallas, and build a robust global online community. The DMA Friends program will provide free membership to anyone who wishes to join and will include opportunities for increased access to Museum programs and staff. The DMA Partners program will seek the support of individuals, corporations, and foundations desiring to be a part of the Museum’s efforts to deliver access to its extensive collection and diverse public programs. DMA Partners are also welcome to become DMA Friends and earn rewards through engagement. DMA Friends earn rewards by engaging with the Museum both at the DMA and online. We will also create a new online engagement platform through which virtual badges are awarded to Friends who really plug-in and make the DMA a vibrant place to be. Badges will give you new ideas about ways to use the Museum that you’ve never thought of before. Earning badges will unlock special rewards and recognition like free tickets to special exhibitions or behind-the-scenes tours with DMA staff. Our reasons for going free can be explained very simply: the DMA values the participation of the public more than we value the modest return realized from paid general admission. Art museums are different from other cultural destinations because we don’t rely as much on admissions to pay the bills. Our model is closer to that of a public library: we receive substantial philanthropic support from generous individuals, government agencies, foundations, and corporations, and we serve the public by seeking an educational outcome, not a commercial one. The best part of our work is in seeing how artworks from across 5,000 years of visual creativity can change the way we think about the world, and how we feel about ourselves, as individuals and as a society. We look forward to welcoming you and to learning together. Find out more about DMA Friends & Partners in the Press Room and watch yesterday’s press announcement below. Robert Stein is the Deputy Director at the Dallas Museum of Art.